Church records for the Meadow Creek Baptist Church shows Harvey L. Gwinn as church clerk from October 22, 1878 until his letter of resignation on August 3, 1895. 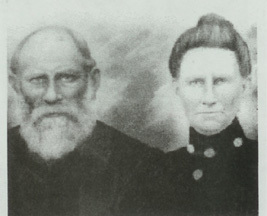 The church was established on October 21, 1878 and the next day they held a special meeting at which time they elected officers and Harvey was elected as the church clerk. After serving as church clerk for nearly 17 years, it's thought that Harvey and Mary may have moved somewhere around Red Springs. 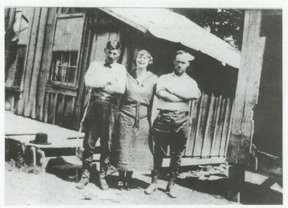 Pictured left to right: Cline Gwinn (son of Henry Gwinn), Margorie Bailey (daughter of Beecher Gwinn) and Lessie Fox (Cline Gwinn's daughter in law's brother) from "A Picture of the Past, Red Springs, West Virginia" by Eileen Ennis Fox. p.38. The books states that the store was located where "Sis" Gwinn lives today. It was owned by Harvey Gwinn and a post office was once located in the building.